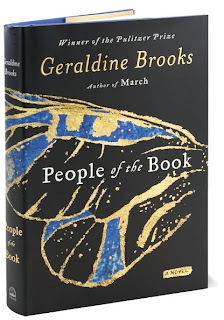 We may need scorecards to keep up with all the people, places, and events we'll discover in People of the Book by Geraldine Brooks. 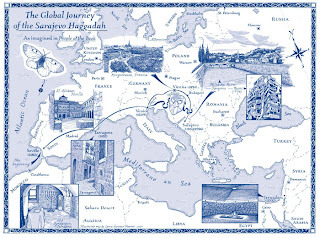 In 1996, Hanna Heath, an Australian rare-book expert, is offered the job of a lifetime: analysis and conservation of the famed Sarajevo Haggadah, which has been rescued from Serb shelling during the Bosnian war. Priceless and beautiful, the book is one of the earliest Jewish volumes ever to be illuminated with images. When Hanna, a caustic loner with a passion for her work, discovers a series of tiny artifacts in its ancient binding — an insect wing fragment, wine stains, salt crystals, a white hair — she begins to unlock the book's mysteries. The reader is ushered into an exquisitely detailed and atmospheric past, tracing the book's journey from its salvation back to its creation. In Bosnia during World War II, a Muslim risks his life to protect it from the Nazis. In the hedonistic salons of fin-de-siècle Vienna, the book becomes a pawn in the struggle against the city's rising anti-Semitism. In inquisition-era Venice, a Catholic priest saves it from burning. In Barcelona in 1492, the scribe who wrote the text sees his family destroyed by the agonies of enforced exile. And in Seville in 1480, the reason for the Haggadah's extraordinary illuminations is finally disclosed. Hanna's investigation unexpectedly plunges her into the intrigues of fine art forgers and ultra-nationalist fanatics. What do you think of Hanna's reasoning? Will all humans someday be blended? I think that my library copy of this book will be in in the next few days! I am very much looking forward to reading it! Bonnie, I can't see the map on my computer. I just see a thin long horizontal rectangle with the words "Click to Enlarge Map" below it. When I click the rectangle, I get a blank page with [people-of-book-map.jpg] at the top. Is anyone else having this problem? I use FireFox but never have difficulties with images on it. Okay, I'm being brave and heading to the sketchy regional branch library near me to get a card and see if I can get or reserve People of the Book. I'm reading March by Geraldine Brooks with another book club this month and really like it even though I didn't think I'd be interested in the subject matter in the first place and ended up deciding to read it because it had won a Pulitzer. So I'm interested to see what she does with a book topic I am interested in. i'm 89th on the "hold" list at my library; i hope i can get the book in time to participate in the discussion! btw i can't see the map either. so use that to copy or print the map. I haven't seen the book yet, so it's possible the map is inside the book. Can anybuddy enlighten us about that? Alison, if you are 89th on the waiting list, you may not see that book for years ... lol. I hope you get it in time to read it with us. Okay, I'm at my mom's house and I can see the map now. It might be my FireFox. Yes, this map is used as the end papers in both front and back of the hardback copy.